There have been a few new themes in WinterBoard lately. I think there are a couple worth mentioning. 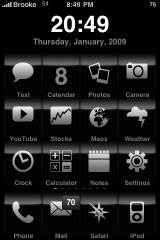 The first theme Stormy Black, via modmyi, requires blank icons at the top of each page. 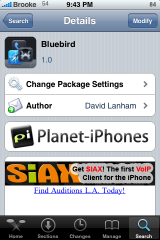 You can easily create blank icons using iBlank The second theme Bluebird, via BigBoss, is a clean blue and black theme. The other two mods that I thought I would mention are page dot mods. We do not see a lot of these so, I always like to point them out. 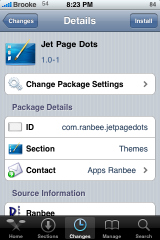 Both American Page Dots and Jet Page Dots are available via the Ranbee source. 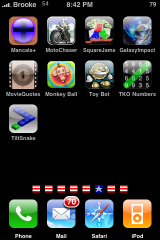 All of these mods are activated using WinterBoard. I agree it is awsome. I had my iphone hacked 2.x and used the instructions on this site to go back to native mode. 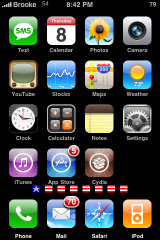 But I noticed after I did that, a winterboard themed app that had “ghost” icons (for the blackberry theme), that allowed for the top row of the main springboard page to show the big time, were left afterwards. Now I have a factory phone with these “ghost” or invisible icons that won’t go away and when accidently touched take me to dezign999.com. My question is, how do I remove these?! Sorry for the post here but could find a way to contact directly and couldn’t find information online. Thanks! Did you find a fix? I am having same problem. 4 hidden icons. Ssh to var/mobile/Libary/webclips and delete what’s in there and problem solved.